Mercury(II) oxide, also called mercuric oxide or simply mercury oxide, has a formula of HgO. It has a red or orange color. Mercury(II) oxide is a solid at room temperature and pressure. The mineral form montroydite is very rarely found. In 1774, Joseph Priestley discovered that oxygen was released by heating mercuric oxide, although he did not identify the gas as oxygen (rather, Priestley called it "dephlogisticated air," as that was the paradigm that he was working under at the time). The red form of HgO can be made by heating Hg in oxygen at roughly 350 °C, or by pyrolysis of Hg(NO3)2. The yellow form can be obtained by precipitation of aqueous Hg2+ with alkali. The difference in color is due to particle size, both forms have the same structure consisting of near linear O-Hg-O units linked in zigzag chains with an Hg-O-Hg angle of 108°. 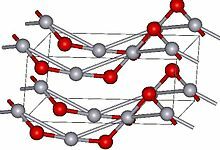 Under atmospheric pressure mercuric oxide has two crystalline forms: one is called montroydite (orthorhombic, 2/m 2/m 2/m, Pnma), and the second is analogous to the sulfide mineral cinnabar (hexagonal, hP6, P3221); both are characterized by Hg-O chains. At pressures above 10 GPa both structures convert to a tetragonal form. HgO is sometimes used in the production of mercury as it decomposes quite easily. When it decomposes, oxygen gas is generated. It is also used as a material for cathodes for mercury batteries. The label on an HgO powder bottle. Mercury oxide is a highly toxic substance which can be absorbed into the body by inhalation of its aerosol, through the skin and by ingestion. The substance is irritating to the eyes, the skin and the respiratory tract and may have effects on the kidneys, resulting in kidney impairment. In the food chain important to humans, bioaccumulation takes place, specifically in aquatic organisms. The substance is banned as a pesticide in the EU. Evaporation at 20 °C is negligible. HgO decomposes on exposure to light or on heating above 500 °C. Heating produces highly toxic mercury fumes and oxygen, which increases the fire hazard. Mercury(II) oxide reacts violently with reducing agents, chlorine, hydrogen peroxide, magnesium (when heated), disulfur dichloride and hydrogen trisulfide. Shock-sensitive compounds are formed with metals and elements such as sulfur and phosphorus. ^ a b c "Mercury oxide (HgO) crystal structure, physical properties". Semiconductors · II-VI and I-VII Compounds; Semimagnetic Compounds. Landolt-Börnstein – Group III Condensed Matter. 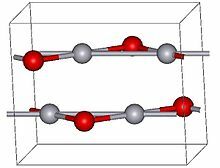 Landolt-Börnstein - Group III Condensed Matter. 41B. Springer-Verlag. 1999. pp. 1–7. doi:10.1007/b71137. ISBN 978-3-540-64964-9. ^ Chambers, Michael. "ChemIDplus - 21908-53-2 - UKWHYYKOEPRTIC-UHFFFAOYSA-N - Mercuric oxide [ISO] - Similar structures search, synonyms, formulas, resource links, and other chemical information". chem.sis.nlm.nih.gov. ^ Almqvist, Ebbe (2003). History of Industrial Gases. Springer. p. 23. ISBN 978-0-306-47277-0. ^ Aurivillius, Karin; Carlsson, Inga-Britt; Pedersen, Christian; Hartiala, K.; Veige, S.; Diczfalusy, E. (1958). "The Structure of Hexagonal Mercury(II)oxide". Acta Chemica Scandinavica. 12: 1297–1304. doi:10.3891/acta.chem.scand.12-1297. Retrieved November 17, 2010. ^ Moore, John W.; Conrad L. Stanitski; Peter C. Jurs (2005). Chemistry: The Molecular Science. Thomson Brooks/Cole. p. 941. ISBN 978-0-534-42201-1. ^ Chemicals Regulation Directorate. "Banned and Non-Authorised Pesticides in the United Kingdom". Retrieved 1 December 2009. ^ "Mercury (II) oxide". International Occupational Safety and Health Information Centre. Retrieved 2009-06-06. Wikimedia Commons has media related to Mercury(II) oxide.